Since moving to the Northwest seven years ago, I have become a huge tea fan. In the mornings, I allow myself one coffee drink and then switch to tea. I prefer tea with flavor, sweetener and milk. Therefore, hearty comfort flavored teas are my favorite. 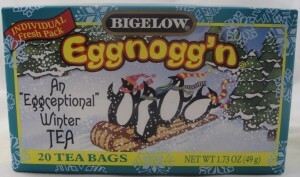 Recently, at my local Albertson’s, I found Eggnogg’n tea from Bigelow. I’ve enjoyed a cup every morning since. I prepare it with one packet of splenda and two tablespoons of light egg nog and find it very satisfying. Unfortunately, the flavor isn’t too much like egg nog. Personally, I find egg nog to have fruity rum notes, with vanilla, nutmeg and cream character. 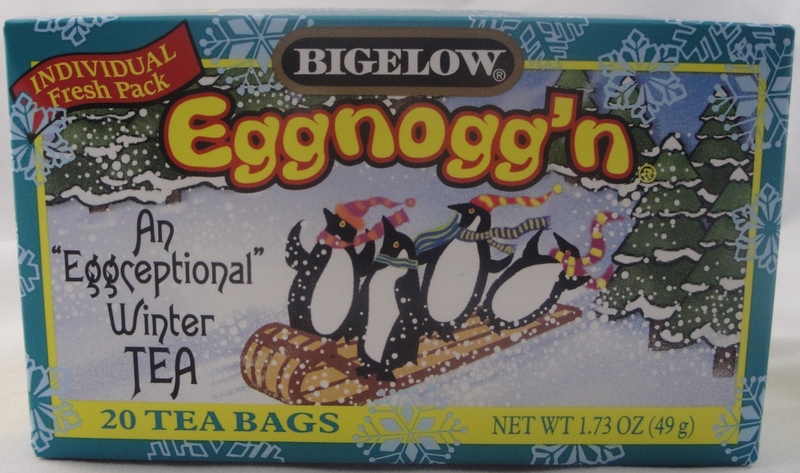 There is little rum or nutmeg flavor in Eggnogg’n tea from Bigelow. The tea is very buttery, caramelized and sweet, like chocolate chip cookie dough ice cream. Enjoyable, but not what I expected. Besides the buttery notes, I get nice tea flavor follow through. The tea flavor comes through like the aroma of sweet hay and blends nicely with the Eggnogg’n flavor. The ingredients for Bigelow Eggnogg’n tea list :black & green tea, eggnog flavor with other natural flavors (soy lecithin), cinnamon. I’ve tried to taste the cinnamon, but it just doesn’t come out. It’s a disappointment that the cinnamon flavor is weak and I wonder if something went wrong in the production of this tea (did they forget the cinnamon?). There is contraversary surrounding the use of soy lecithin in flavored teas. Soy lecithin is an emulsifier and lubricant which has many uses in the food industry. It is natural and non-toxic. I don’t know exactly why it is used in the flavorings in tea and I am curious to understand it’s function. Flavored tea is one of my favorite products. If it weren’t for tea, I’d be amped out on coffee all day. Tea is warm, relaxing and satisfying.